When you stay at Sands Beach Club Resort in Myrtle Beach, you'll be on the beach, within a 15-minute drive of Barefoot Landing and The Carolina Opry. This beach hotel is 8.6 mi (13.8 km) from Ripley's Aquarium and 8.9 mi (14.3 km) from Broadway at the Beach. Make yourself at home in one of the 214 air-conditioned rooms featuring kitchens with refrigerators and microwaves. Rooms have private balconies. Complimentary wireless Internet access is available to keep you connected. Conveniences include safes and separate sitting areas, and housekeeping is provided daily. Don't miss out on the many recreational opportunities, including an outdoor pool, an indoor pool, and a fitness center. This hotel also features complimentary wireless Internet access, concierge services, and a television in a common area. At Sands Beach Club Resort, enjoy a satisfying meal at the restaurant. Wrap up your day with a drink at the bar/lounge. Breakfast is available for a fee. 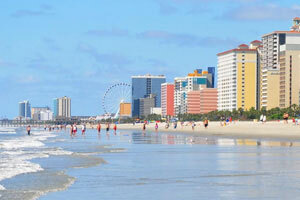 The preferred airport for Sands Beach Club Resort is Myrtle Beach, SC (MYR). Only bookings from non-local guests are accepted. Guests whose residence is within the same city as the property will not be allowed to check in. Please note that cultural norms and guest policies may differ by country and by property. The policies listed are provided by the property. Guests 18 to 20 years of age will be charged a security deposit which will be refunded, less damages, seven days after departure. The deposit must be paid to the hotel at least 48 hours prior to arrival. Guests can contact the hotel using the information on the reservation confirmation they will receive after booking via this Web site.